For thousands of years mankind has felt the need to erect a memorial to mark the sense of loss, love and respect felt for a family member or friend. It provides a focal point of affection and remembrance as a celebration of a much cherished individual life. It is a statement of not being forgotten. It can be an expression of undying love and a help in the grieving process through which we are all likely to go at some point in our lives. There is a wide range of choice both in product and price. 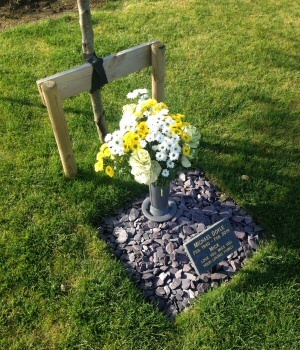 As a result, we hope that you will be able to find a memorial that you feel is appropriate in this setting and at a price which you feel comfortable with. Please do not hesitate to approach a member of our staff if there is anything which you would like to know more about or simply discuss. They are there to be of assistance to you. 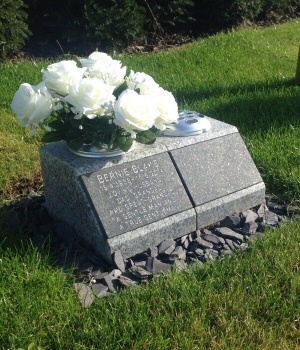 Our staff are not only at your service to select a fitting memorial, if you require them to do so; but they will also assist you with the necessary paperwork, and make you aware of the terms, conditions and general regulations. They can do this on the site, over the phone, via email, by sending information to you in the post or by visiting you at home. The choice is yours. Many of the below options have variations and can be tailored to personal taste. Moreover, we can supply any of the products shown, and arrange for their installation, in any part of the United Kingdom; in private addresses, crematoria, cemeteries or churchyards subject to local restrictions and regulations. Please contact us for a personal written quotation. 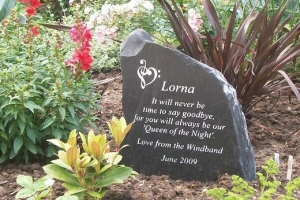 Garden & Lake Markers markers are carved from local stone or from a range of granites from UK quarries. The stone is bored out to allow the incorporation of the cremated remains and are capped with a bronze dedication plate. These may either sit in the water at the edge of the lake or on the path by the lake. The miniature monolith stone memorial provides a traditional grave setting. 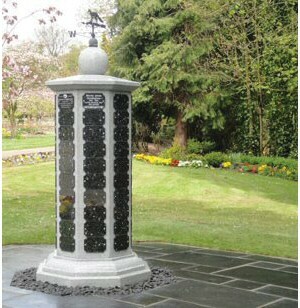 Engraving and relief designs for the memorials can be tailored to suit an individual’s wishes. 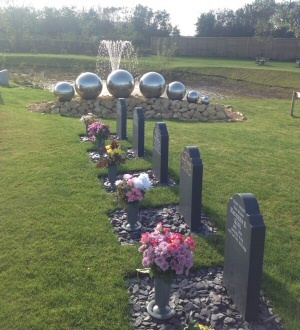 There is a choice of two stone types that will be mounted within a defined interment area providing a personal setting for up to four sets of cremated remains. Family plot for cremated remains in natural burial section for 4 interments with renewable 15 year lease in GIS marked location. Plaque on Barbican obelisk is included. The polywood bench is 60 inches long; designed to keep its shape and colour, it doesn’t suffer from salt, algae, lichen and weathering problems associated with traditional wooden benches. 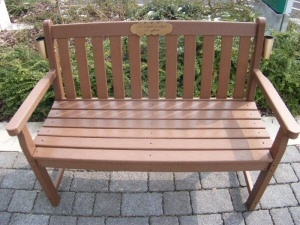 The bench can have up to three brass plaques mounted and inscribed with an individuals dedication. 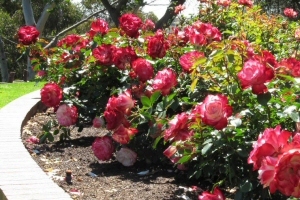 A range of classic rose trees and bushes are available with mounted brass and stone dedication plaques. 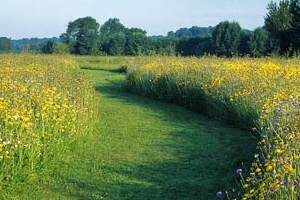 Private beds have been especially created to provide a natural setting for memorials. Family gardens are dedicated to one family and allow the burial of up to four sets of cremated remains. Each garden is individually planted with a bespoke collection of planting designed by our head of grounds to provide a distinct, private area for you to visit. The price includes the first interment and a granite boulder inscribed with 50 letters. Exclusive adoption of existing avenue tree for 2 interments with renewable 15 year lease, to include plaque. Plaque on Barbican obelisk with 15 year renewable lease. 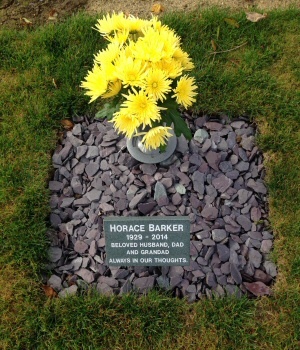 Garden memorial plaques for buried cremated remains, 15 year renewable lease. 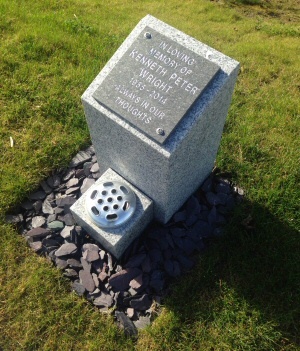 Granite splayed memorial vase with 15 year renewable lease to include plaque. Double vase also available (as pictured). Situated in the main chapel building, entries in the book of remembrance are available and can be viewed during normal opening times. 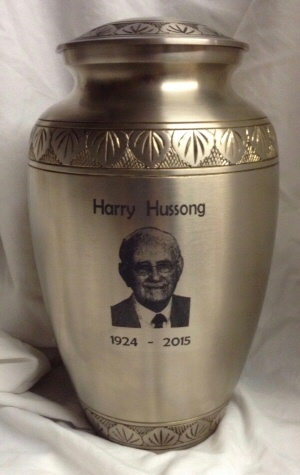 A selection of Aluminium Urns and Keepsakes which, by using the most advanced technology, can be laser engraved with an image or name of a loved one. All Memoria crematoria will accept (for no charge) cremated remains for an unattended scattering irrespective of where the cremation took place. 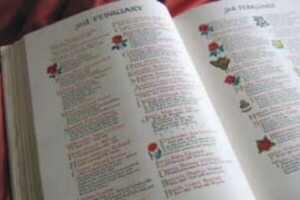 Attended scattering services and memorials can also be purchased, at current prices (without surcharge) if desired.